I'm not exactly sure what the posts to this blog are going to look like next month, but because I've decided to take on a couple of challenges, I can tell you that there will be a post up here every day in April. Last year I participated in the 30 Days of Biking and it was quite fun so I decided to do it again. 30 days, 30 rides, 30 posts. I don't promise anything huge, but I'm going to get a ride in and a photo and some text posted each day. If want to join in the fun of 30 Days of Biking there's still time to sign up. My friend Mimi pointed me to another challenge and I realized I could do Blogging From A to Z in April together with 30 Days of Biking. I think combining these two challenges into one is a brilliantly stupid move on my part, akin to Spinal Tap's amplifiers that go to eleven. The results of this Alphabetical Bikeological Challenge will be revealed, day by day, in April. So stay tuned. And if you have any suggestions for letter themes for a day, leave them in a comment. Right now, I suspect my final ride in April may involve riding up Zoo Hill. WD-40 has a bad reputation among many bike mechanics because some people try to use it as a chain lube. WD-40 will quiet a squeaky chain for about 2 minutes but it is far too light to be used as a lube. This doesn't mean that WD-40 is useless when it comes to the bike, however. Used properly, WD-40 is very handy for cleaning away grime, loosening corroded parts and displacing water. 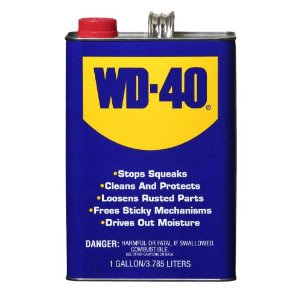 The WD in WD-40 stands for "Water Displacement" and when mixed with water it becomes kind of soapy. When I worked with Ryan Linville at Bike Works a few years ago he taught me a neat trick he'd learned at a shop in New York. Ryan mixed WD-40 with water and put it in a plastic trigger spray bottle. He called the stuff "Bling Juice" and depending on how strong you want to make it you can play with the ratio of WD-40 to water. Two parts WD-40 to one part water works pretty well, but a 50/50 mix makes the supply of WD-40 last longer. You shake it up and you know you've got the ratio right when the result is kind of foamy & white. Bling Juice is really good at cutting through road tar, grease and drive-train gunk. It does leave behind a film, so don't get it on braking surfaces or brake pads. It will clean away crusty & dirty old lube, so be sure to re-lube parts that need lubing with a real lube after you've done your cleaning. So that's my tip for the day. WD-40 mixed with water. It's lousy as a lube, but it's wonderful as a cleaner. In the old days, when what we now call "Friction Shifting" was just called "Shifting", the bicycle shifter was a pretty simple mechanism. A lever, held in place by either friction or a ratcheting mechanism, would pull on a length of cable and the cable in turn would move the derailleur. Riders shifted by sound and feel to get the chain to settle into just the right spot on the desired gear. If the cable housings settled in a bit (something often mis-termed as "cable stretch") the rider would just move the lever to a slightly different spot, often without even conscious thought. It's a system that still works quite well and many folks, including my friend Jan Heine, speak quite eloquently on the virtues of friction shifting. Friction shifting takes a bit of getting used to and in the 1980s indexed shifting became the dominant way that riders conveyed their gearing desires to their machines. If the old lever was like a radio dial that you'd turn until the station sound came in clearly, the new levers were the push button that would take you right to the exact frequency of the station. When properly adjusted, an index shifter clicks you into the right gear at the push of a button. Indexed shifting requires that the cable tension be correct and the housing length constant, so modern shift housing is constructed to be "compressionless". It's not 100% compressionless, but for the imperfect world in which we live, it's close enough. As with many things bike related, Sheldon Brown has an excellent article in which he discusses bike cables. The important lesson there is that brake & shift housing is doing different jobs an on modern bikes, they have different construction. NEVER use modern shift housing for brakes! When index shifting works, it tends to work well but when it doesn't work, it is often a case of the cable tension being off. Again, Sheldon has an extensive article that explains in detail most derailleur adjustments. Sharp-eyed readers will note that Sheldon and I differ on our opinions of the proper spelling of derailleur, but that is one of the rare areas where he and I disagree. He's probably right, but I'm stubborn. I'm always amazed when I find a bicycle subject Sheldon didn't address completely in his too brief life but in searching for "Gummy Indexed Shifters", I didn't find what I thought was common knowledge. In the spirit of Sheldon, I'll tell what I know about fixing gummy shifters. The inside of an index shifter looks like a little clock. There are tiny gears and springs and little ratcheting pawls that grab the gears. Sometimes a gear may chip a tooth or a spring may break. If you have a Campagnolo shifter, the hands of a watchmaker, the patience of a saint and the proper spring, you may be able to fix it. If you have a Shimano shifter, the folks at Shimano will sell you a whole new shifter. Before you launch into a Campagnolo is great and Shimano is evil rant, price out the cost of that little spring and what current shop labor rates are in your area. Most often though, the problem with a shifter isn't that anything is broken, it is that the ratcheting pawl is not springing down to grab the gear. The most common cause of this is age and lack of use. When bikes sit for a long period of time, like in storage over the winter, the grease on those pawls gums up and becomes less like grease and more like glue. The symptom is often a gummy feeling in the lever, the lack of that crisp "click" sound and an inability of the bike to shift into one or more of its gears. The solution is to flush out the gummy grease and get some new lubrication on the working parts. Often times you can do this without disassembling the whole shifter. I swear those shifters are put together by tiny robots so unless you have tiny robot tools you are really better off not opening things up more than you need to. The technique I've had the best luck with, the one that works in about eighty percent of the gummy shifter cases I've seen, is to use a penetrating lube. PB B'laster , which you should be able to find at your local auto parts store. PB B'laster is like a miracle drug for gummy shifters. It comes in a pressurized can that sprays out a fine stream you can direct into the nooks of a shifter to blast the old gummy grease away. PB B'laster leaves behind a good film of lube. Once I get the shifter working with PB B'laster , I add a bit of a light lube like TriFlow . In some cases I wind up having to partially disassemble the shifter so I can remove some of the old gummy grease with a dental pick, but usually spraying the penetrating lube while working the shifter mechanism back and forth is enough to get things going. If this article helps even one person keep an old bike going, then I figure I've done my job. 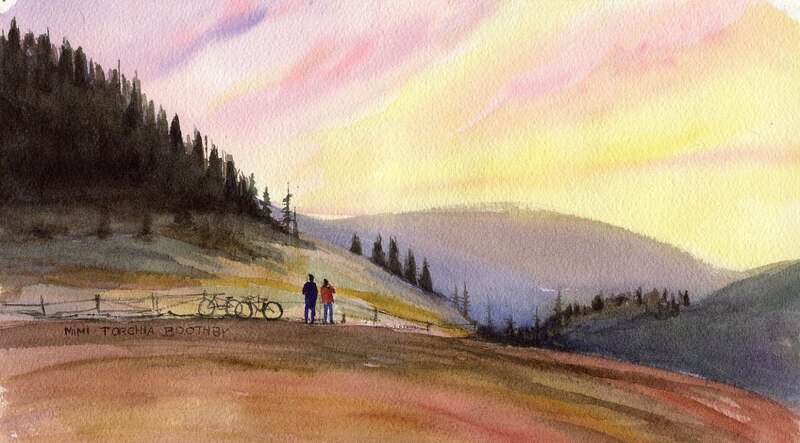 The above picture was painted by my friend Mimi Torchia Boothby last December. I just found the picture yesterday on her blog and I think it’s amazing. Mimi did such a wonderful job of capturing the beauty of seeing the world with your best friend. I just sent an email to Mimi and I’m buying the original painting for Christine. I've known Don and Mimi Boothby for quite a few years now and while I've always known Don as a tough old randonneur, he's also a hell of a dreamer and a story teller. Want proof? Check out this post from his blog. I don't think it's a coincidence that I've met so many kindred souls via bicycling. Christopher Morley wrote that "the bicycle, the bicycle surely, should always be the vehicle of novelists and poets." I'll add artists to that list and folks who take the time to appreciate the sunset with a friend. Yesterday while riding home from the Seattle Bike Expo, I stopped to watch a bit of bike polo at Judkins Park. The women and men playing have really good bike handling skills and it looked like they were having a lot of fun. According to a sign at the park, hard court bike polo was invented in Seattle. I've posted previously about the bicycle embedded in a tree on Vashon Island. Yes, it exists. No, it's not photoshopped. Recently I've been getting a zillion hits on the old posts on the blog because people keep posting the picture on Facebook with some bogus story about a boy leaving his bike in the woods and going off to fight and die in World War One, never to return. I leave it as an exercise for the reader to see all the holes in that story. The true story is revealed in this article from the December 30th, 2009 Vashon-Maury Island Beachcomer. The bike dates back to the 1950s and the kid who left the bike went on to be a King County Sheriff's deputy. The bike is still there in the tree and Vashon is still a lovely place to ride. It's worth the stopping by to check it out. If you want to read a great fictitious story about the bicycle in the tree, check out Berkeley Breathed's classic tale Red Ranger Came Calling .